We've known for a while now that Amazon wanted to start offering local services. Now, the store for everything is selling TV-mounting services ahead of all the TV sales on Black Friday. And you know what? That sounds like a pretty useful addition to the Amazon family. The company is now testing Amazon Local Services in nine different cities. 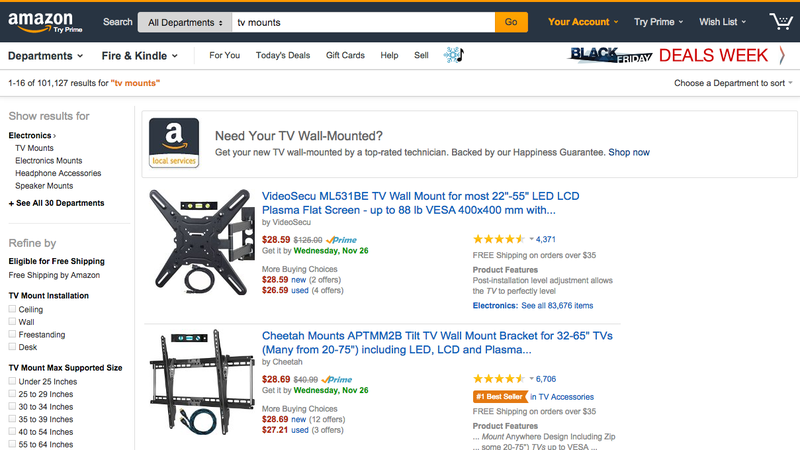 If you search for "tv mounts," a little box pops that asks if you a TV mount installed. Clicking through takes you to a list of all the available TV-mounting services and the option to add the service to your cart. Amazon even offers its "happiness guarantee" for the services so if the service stinks, you can take that up with Amazon instead of the local purveyor. Of course, you could also just do a Google search for "tv installation" or something, but that would require you to leave the Amazon ecosystem.